A few years into her Suzuki violin training, Erica Brown got bit by the bluegrass bug. It hit her hardest when her parents took her to Portland to see her hero, Alison Krauss. After the concert, the eight-year-old caught up with Krauss in the parking lot where Brown told her she’d been taking lessons. After nearly thirty years of playing the fiddle, Erica Brown still isn’t sure why she picked up the instrument at six years old. There wasn’t a lot of music played in her Lewiston household. She hadn’t even heard much violin music before. But whatever the reason, she knew it was the very thing she wanted to spend her life learning. Once she finished classical lessons, she shifted her focus to fiddle music and began studying under Don Roy, the great Franco-American fiddle player, who became a lifelong friend and mentor. When she was nine, he invited her to be a part of The Maine French Fiddlers, with whom she toured throughout New England and the Maritimes, as well as a week long tour through Louisiana. She was the youngest player in the group by far. As her playing grew stronger, her opportunities multiplied, and the accolades began rolling in. She was crowned Junior Female Entertainer of the Year by the Maine Country Music Association, received the Harold Carter Memorial Award from the Down East Country Music Association, was a recipient of the Maine Arts Commission Traditional Arts Apprenticeship Award and was recognized as a Master Artist by the Maine Arts Commission. She has released six solo albums and tours regularly throughout New England and the Atlantic Maritimes. But none of that has affected her humility or sense of hard work, said Alden Robinson, a fiddler in Portland’s The Press Gang and a friend of Brown’s. In addition to a handful of side projects, she plays regularly in two bands: Erica Brown and the Bluegrass Connection has been going strong for over fifteen years and Darlin’ Corey- a duo with her husband, the multi-instrumentalist Matt Shipman- has turned from side project to regular gigs and recording, including the monthly engagement at Blue in Portland. Darlin’ Corey released an excellent album, “When Evening Falls” in late 2016 that caused some buzz. She and Shipman recently started offering music lessons out of their home in the Nason’s Corner neighborhood of Portland. It’s called Darlin’ Corey Studios and they have about twenty regular students as well as jams, ensembles, and harmony singing groups. LEWISTON — When Erica Brown was just a tot, she would sit on her grandfather’s knee and listen to him play French Canadian tunes on the harmonica. When he stopped, she’d push his hand back toward his mouth to keep him playing.That love of French Canadian music has been with Brown from the time she picked up the violin at age 6 and into her career as a fiddler. At age 22, Brown has 13 years of professional performances to her credit, three CDs released under her name and her own band, Erica Brown and the Bluegrass Connection. Considered a master of a traditional art by the Maine Arts Commission, Brown also finds joy in passing her musical heritage on to a number of students. She does all this while juggling a couple of office jobs, working on a fourth CD and attending school full time at the University of Maine at Augusta, where she’s pursuing a degree in jazz and contemporary music, with a concentration in audio recording. Her accomplishments are unusual for someone her age, said Greg Boardman, Brown’s first teacher who is the orchestra director for the Lewiston public schools and a fiddle instructor at Bates College. “She had love, she had talent and the drive,” Boardman said. Brown’s first performances were with Maine French Fiddlers, a group that has since disbanded. Don Roy, a fiddler and another of Brown’s former teachers, introduced her to that group and watched her performance up close. Roy said Brown brings a liveliness and creativity to her music. “For the music of her heritage and her age, there’s no one any better,” Roy said. Brown doesn’t remember just how she decided as a child to pursue the fiddle, but she’s loved the instrument as long as she can remember. “I never wanted to take a break from it. I never tired of it,” she said. Brown has 13 years of classical violin training under her belt but prefers fiddle music with its improvisation and sense of fun. She plays the same jigs, reels, hornpipes and waltzes played on the harmonica and button accordion by her maternal grandfather, Edmond Parent, who lived in Grand Isle, by the New Brunswick border, before moving his family to Lewiston. For Parent, music was about entertainment, not performance, something he’d do with buddies after a long week of work. He’d learn new songs in these sessions, as he never learned to read sheet music. It’s a different world for Brown, who makes a conscious effort to keep the tradition vibrant. It makes her a bit sad that the bands at Franco festivals are often from Canada and that after performances, someone may tell her it’s been so long since he heard such music. So Brown is excited when young people get hooked on the music. On a recent day, in the basement office of the house Brown lives in with her parents and three brothers, Brown was giving a lesson to 13-year-old Christie Michaud of Greene. Brown was a patient and pleasant teacher as she showed Christie how to press in on the strings to get the desired choppy sound in a dotted hornpipe. Brown also identified why Christie’s bowing was awkward in the triplets of one song and explained the remedy – playing more than one note in a stroke to get the bow moving in the right direction. Brown was encouraging as she played a new song, smiling as she told Christie it was easier than it sounded. Brown played and explained the components before they played together. They then worked a bit on improving Christie’s rhythm. Christie receives her lessons through a traditional arts apprenticeship run by the Maine Arts Commission. Brown, who had been an apprentice under Roy, is one of the youngest masters in the program, which includes a range of traditional arts, from quilting and basketweaving to step dancing and Cambodian music, said Keith Ludden, a community arts and traditional arts associate with the commission. Christie had wanted to play fiddle since she was little and eventually her parents got her an instrument on eBay. The family approached Brown about lessons after a performance. Brown saw a little bit of herself in Christie. Erica Brown’s musical sensibilities are so well developed that if you play a tune for her, she can repeat it on the fiddle. 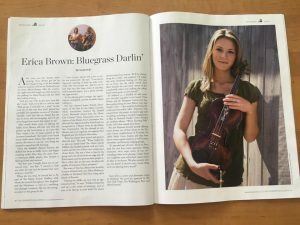 “My classical training has helped me tremendously—it’s great training for your ear,” says the 19-year-old violinist, who applies classical techniques to the rootsy freedom of bluegrass music. And people are listening. Brown has performed for audiences from Canada to Louisiana, earning a reputation on the festival circuit. 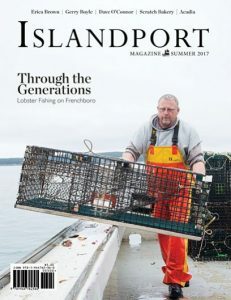 Last year, for example, she opened for Dwight Yoakam at the Maine Lobster Festival, performing for 8,000 fans. Through her travels, she’s met other legendary artists like Kenny Baker and—her idol—Alison Krauss. “I love her to death,” Brown says. In October, she received the 2003 Junior Female Entertainer of the Year award from the Maine Country Music Association. With a soft voice, masterly skills on the violin, and the look of a young LeAnn Rimes, Brown’s star appears to be brightening. She has recorded, produced, and released three CDs of her own—the latest of which, Imagine That, is her first vocal effort—and continues to perform live shows. Brown first got into music at the age of 6, after hearing her grandfather play the accordion and harmonica; and ever since then, music has been her life. Now, with 13 years of experience and her own band, The Bluegrass Connection, Brown is a young veteran. She plans to become an audio engineer after graduating from the University of Maine-Augusta with a degree in music production, and produce not only her own work, but that of other musicians as well. Erica Brown is a little bit country, and a little bit classical. For more than a decade, the Lewiston teen has taken her violin playing in two widely divergent directions. For the past five winters, she’s been a violinist in the Bates College Orchestra, conducted by Bill Matthews. But from spring through fall, she’s a fiddler, appearing as a solo act at about 25 percent of the Old-Time Radio Gang’s New England shows as well as headlining her own bluegrass quartet. Brown said that she finds the precision of classical more difficult than the spontaneity of country fiddle. “With classical, you have to read the sheet music and do what it says,” explained the 18-year-old in an interview at her Lewiston home. “You have to play everything like your partner, because if you don’t, someone will hear it. “In fiddle, you don’t have to play the same way every time,” she added. “It gives you a lot more freedom.” It’s not every senior that has already recorded two CDs (1999’s “Bowing the Strings” and last year’s “Just Taking Notes”). But then, not every high school musician has the willowy blonde’s talent. She credits her grandfather, who played accordion and harmonica, for her passion for music.“I heard a lot of music from him, and I loved to listen to music when I was little,” she recalled. Shortly after she developed an interest in violin, Brown began taking classical lessons (“I’ve had so many teachers, it’s hard to remember them all.”) She’s now studying with Ronald Lantz, second violinist for the Portland String Quartet. Lantz said that while Brown has a burgeoning fiddle career going, continuing classical training has been beneficial for her. “It’s kept mechanics and technique sound, and her playing sharp,” he said. “She’s quite a lovely player, well above average as a classical student.” Rock agreed with Lantz about the value of Brown’s classical training. Brown “slowly wandered off into the fiddle part of things,” and studied for several years with Don Roy of Gorham, whom she calls “my mentor.” By age 10, she was performing with the Maine French Fiddlers, and would go on to tour New England and Louisiana with them. “She’s a great person, and she’s fortunate to have a wonderful family, who support her in everything she does,” Rock said. “They’re good, wholesome, down-to-earth people.” “She’s an incredible person, with very strong family ties,” McHale added. “She was very well brought up.” Brown has been home-schooled since first grade, which she said gives her greater flexibility when it comes to her music. She practices at least an hour a day. When she’s not performing, what does Brown like to do? “Just hanging out with friends, stuff normal teen-agers like to do,” she said. I’ve met some awesome people in my travels. Here are some pictures of them and some comments. The first picture is me with Fred Carpenter. He plays with “Larry Cordle and Lonesome Standard Time”. After attending an Alison Krauss And Union Station concert I had the privilege of being invited into their tour bus to play a few tunes. Here I’m enjoying a visit with veteran fiddler Kenny Baker at the Blistered Fingers Bluegrass Festival. This one is me with Mark O’Connor. This picture shows me with Jim “Texas Shorty” Chancellor at the First Annual Mark O’Connor Fiddle Camp.